The Livestock Conservancy describes Heritage Breeds as “traditional livestock breeds raised by our forefathers. These are the breeds of a bygone era, before industrial agriculture became a mainstream practice. 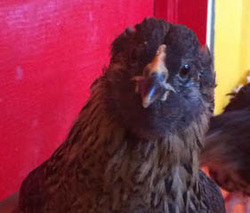 Traditional, historic breeds retain essential attributes for survival and self-sufficiency – fertility, foraging ability, longevity, maternal instincts, ability to mate naturally, and resistance to diseases and parasites.” In a more general sense, heritage animals are the animals that you would find on your great grandparents’ farms. Hereford Heritage Pigs are named for same color pattern on Hereford Cattle, and one of our considerations for our first pig purchase. Noted to be a good pig for beginners, they're docile and very adaptable to climate, pasture or confinement. The Livestock Conservancy chart below compares heritage hog breeds. Click on the chart to go to a printable PDF page of it. The farm scene on the right, of a pig and her piglets supervised by a rooster and hen, might very well depict a scene at the Buck 'n' Mule Farm, but actually comes from the children’s book Visit to the Farm by Koerner & Hayes, published in 1896. Buck and I had gone to visit our dear friends, Bob and Sue, last March to catch up with each other. Our morning visit quickly passed into early afternoon. We were invited to stay for lunch. Pork chops were on the menu. I would normally not order a pork chop off a menu if we were eating out. They never make it on my grocery list. But these were not everyday pork chops from your grocery store…our friends raise heritage pigs. Let me digress for a moment….have you ever gone somewhere and had something to eat that was so delicious that you think about it maybe once a month, or more often? Just the thought of eating it that one time, makes your mouth start to water? You can relive the delectable experience in your mind over and over again as if it were yesterday? OK, with that thought in mind, hear this….these pork chops were all of those things described and more. They were the most succulent, tender, juicy, flavorful pork chops I had ever had in my life. Yes….my whole life. So good in fact, that we were given the green light to just pick up the bone and eat the rest of it…don’t be shy about wasting a morsel of it. ​Three simple words that can unlock so many mysteries in life. Not just on the Homestead but in every day life in general. Just think how much we can absorb by watching and listening. Notice, I did not use the words “looking” or “hearing”. I can look at a lot of things and hear a lot of things but never process any of them. Watching and listening are more intense. By processing what we see and thinking about what we are hearing….we learn. The first lesson Buck gave me in how to hunt was to immerse myself in the woods, sit still, be quiet, watch the wildlife and listen to my surroundings. Even if we never saw a turkey, a deer or a bear it was always a learning experience – what was going on in our surroundings, “reading” that, processing it. There is no place I feel more ALIVE than in the midst of the wilderness. Being immersed in it heightens your senses like nothing else. To me it is spiritual. Having a Homestead, these skills are invaluable. It's important to provide food, water, shelter…but the dynamics of your herd or flock are also important. How do you know what is “normal” for your animals if you don’t spend the time to learn their individual uniquenesses. If you don’t know what is “normal” how can you tell if something is awry? How can you correct anything to improve it without watching, listening and learning? It's important to spend time with your animals, to get to know them. Only in this way can we develop more of a bond with them and provide the best environment possible for them. If we could take this simple principle and integrate it into the rest of our life, just imagine how our personal relationships could be enriched with each other. It is often easier to listen to our animals than to each other. For some reason when people are with each other the silence between them creates an uneasiness. Why can we no longer be comfortable with stillness within ourselves? How can we learn about each other, or ourselves for that matter, if we don’t have that quiet stillness so we can listen to what is being said – verbal or not. Nature and our animals are there to teach us a lifetime of lessons – we just have to allow ourselves to let them. Animals (and especially cats) are experts at observation. It may seem like resting to humans, but when you see that slightly twitching tail, you know they're poised for action - and neighborhood rodents better watch out. SORE-NO-MORE lives up to it's name! ​Most of the first aid, and many of the other products you’ll find in my house and barn, are made with herbs, essential oils or other natural ingredients. Because of that, I use most of those treatments for both my animals and my family. Over the years, the products for human use that I once purchased at the drug store have been replaced by products that I use for my horses and mules. I have always been a stickler about checking ingredients before using anything on (or feeding to) my animals. For many years I was far more aware and particular about what I purchased for my animals than what I used on or fed myself. Since then, I’ve been enlightened. If it’s natural, and healthy enough to meet my strict animal standards, why am I not using them for myself? I’m not an advocate for running to the doctor, urgent care or hospital for every little thing. Those resources have a very important place…but in my life, not for common ailments, bruises, bumps and minor injuries. Somewhere along the way, we’ve forgotten how listen to our own bodies and take care of ourselves. Recently I twisted my foot while walking. I didn’t give it another thought at the time, but a couple of days later, my foot was swollen and the pain was excruciating whether I was sitting or standing. I could barely walk even one step without the pain taking my breath away. I limped out to the barn and grabbed my Equilite™ Sore-No-More Cooling Clay Poultice. I had used it several times on my horse when she was recovering from a splint bone surgery, with amazing results. It’s a clay-based poultice with a variety of herbs in it. When I got home, I took a handful of the poultice and put a layer of it on my foot and ankle, and wrapped it loosely with Vetwrap® bandaging tape. Then I elevated it and put ice on it. The next morning, I removed the wrap and discovered I could walk without pain. The swelling was completely gone and I had only some slight stiffness when walking. By the following day I was back to 100% and doing all my daily chores with no pain or hindrance. Note: The information contained on this website is not meant to diagnose, treat, cure, or prevent any disease. Please see the disclaimer at the bottom of this page for more information. "Try it! You'll like it!" Traditional Scandinavian-style gravlax, also known in the Northeast USA (that is, Yankee Land) as lox, is seasoned with dill. We like it that way, but because we greatly prefer homegrown herbs and vegetables, and growing dill in the sun-baked red clay of the mid-South is a challenge, we've had to improvise. Since trying this recipe using tarragon and/or fennel instead of dill, we rarely make the dill version any more. The brown sugar enriches the final dish rather than sweetening it. To compress the salmon while it's "curing", use a heavy weight like a brick (wrapped in aluminum foil) or canned goods. We use a lead ingot similar to a commercial net weight. My husband found it when canoeing in the Connecticut River years ago, so we can't tell you exactly where to find your own, but it works well for us. To ensure that the weight is evenly distributed on the salmon, we use a rectangle of plywood measuring about 4" x 7" that we keep in a sealed zip-lock bag. You can also use a hardcover or paperback book (preferably one that will be forever dedicated to the making of gravlax). The plywood piece we use fits well on top of salmon in a standard loaf dish. 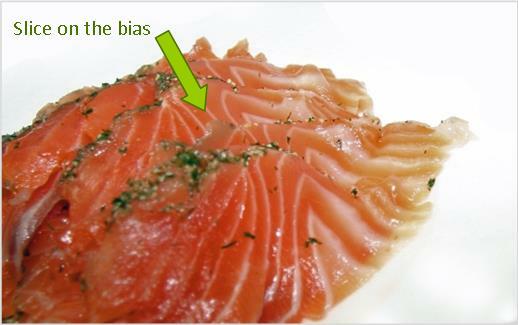 If you're working with bigger salmon fillets and/or dishes, adjust accordingly. Mr. Parker (my husband) has been making venison jerky for years. It's good, but pales in comparison to his salmon jerky. Unlike most commercially sold jerky of any description, it's not dried down to leather and should be stored in the refrigerator. 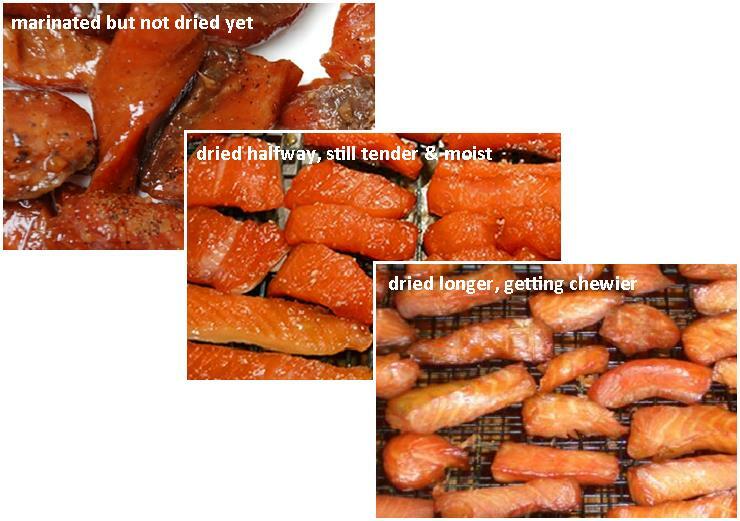 We love the smooth texture of the partially-dried salmon. Make it as dry and chewy as you like, but I strongly suggest that you eat a piece halfway through the drying period. You may find you like it better that way. If not, continue drying until it's done to your preference. You'll need a food dehydrator for this project. Ours is an old, discontinued Equiflow. There are plenty of others on the market at a variety of price points. << The recipe calls for Bragg Liquid Aminos, a liquid seasoning that's available in most health food stores. It looks like and tastes like soy sauce, but less salty and not quite as assertive, so less likely to cover up the flavor of your food. You can also use it as a substitute for Worcestershire and tamari sauce. Used in combination with soy sauce, it's a winner in this recipe. The recipe also calls for fresh ginger. Substitute dried <<ginger if you must, but Gourmet Garden fresh "stir in" ginger works magic with the salmon. The finished jerky doesn't taste like ginger, but if it weren't in the marinade, your jerky would be mediocre at best. I happen to hate peeling and grating fresh ginger root, so we use fresh ginger paste, which is easily found in the produce section of most supermarkets. Direct application means applying drops of oil directly to the skin or fur of an animal in a “drop” form. This can be done with neat or diluted oils. Make sure you know the specifics about each oil before you use it on you animal. Do NOT apply HOT oils directly on your animal. (See February Issue about Carrier Oils). 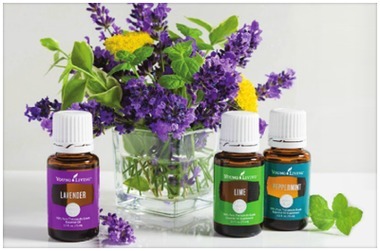 Direct application has great benefits when used in the Young Living Raindrop Technique, and is used that way quite often. It may be used in applications such as dripping oils directly into a wound or abscess, onto a site where acupuncture is to be performed, onto a hoof or any other site of intense need. To apply topically, put a drop or two of essential oil into your palms (diluting for the size/sensitivity of the individual), rub your palms together and then pet or massage into the desired location. Warning: dropping undiluted essential oils directly onto the skin where they pool in a concentrated space will increase the likelihood of skin sensitivity and skin reactions. If this happens, dilute with any type of fatty oil, NOT WATER! Water is a driver and will increase the absorption rate of the oils, intensifying the sensitivity. NEVER use an essential oil to counter the effects of another essential oil. Again...always use a fatty oil such as Young Living's V-6 oil, olive, almond or coconut oil. Layering is another topical application technique. With layering, rather than combining several oils together then applying, you apply each oil separately, one after the other, following the same technique as topical application. Wait a few minutes in between each layer to allow it time to absorb. There are many good places to apply oils topically to equines. The poll/brain stem (mental clairity/focus), TMJ (awareness/proprioception), along the spine (nervous system), over the withers and croup (calming/balancing), around the chestnuts (calming, relaxing), over the sternum (emotional uplift/release/clearing)...all can be acceptable application locations for your equine depending on the goal you have for use of the oil. Applying to the little hollow between the heel bulbs at the back of the pastern, the sternum and under the jaw can be good alternate application locations. Topical application of photosensitive oils should only be applied to areas of the body that will not receive direct sunlight. Another option is to leave your equine indoors approximately 8 hours after applying such oils or apply at evening time. ​A Wild Heart Mustangs SPECIAL - the Everyday Oils collection is available to our readers at 10% off the retail price. Special price for this collection $153.65. (Available at the Resources listed below). We're transplanted Yankees who don't miss much (other than friends and family) about living in the Northeast. We love living in rural America, with cattle as our closest neighbors. We love having the room for our own orchard, vegetable garden, 11 rescue dogs and cats, and privacy that we just couldn't find (or afford) in New England. ​Nowadays we buy grocery store salmon, which is sometimes "fresh", sometimes frozen, too often farm-raised. Not only do we struggle to put the nasties that could hide in farm-raised fish out of mind, it just doesn't taste as good. Wild-caught salmon is very expensive here, be it fresh or frozen. We try to use recipes that boost the flavor and texture of frozen salmon. If you're lucky enough to try these recipes with truly fresh salmon you caught yourself, back off on the seasonings by about 25%. Make sure the salmon fillet is bone-free. You may have to pluck out strays with tweezers. Mix the salt, sugar, and fennel in a bowl, then spread about a third of the mixture in a baking dish big enough to hold the whole fillet. Lay the salmon in the dish skin side down. Sprinkle with the tarragon and the rest of the seasoning mixture. Cover the fish completely with plenty of plastic wrap. Place the plywood on top of it, and the weight on top of that. Refrigerate for 24 hours. Remove the fish from its wrapping and scrape off any seasoning that hasn't been completely absorbed, and discard the fresh tarragon. Before serving, you can rinse the fish if you like (we don't) and pat it dry with paper towels. To serve, use a very sharp carving knife to slice the fish on the bias as thinly as possible. Serve it with toasted bagels, cream cheese, thinly sliced onion, lemon wedges, and a sprinkle of capers. It's also a tasty garnish for hard-boiled or deviled eggs, green salad, served alongside an omelet or scrambled eggs, in Eggs Benedict instead of Canadian ham, with latkes (potato pancakes) and sour cream, or all by itself as a quick and yummy snack. I'd have to think hard to imagine a way to eat gravlax that isn't wonderful. Well, maybe not with fudge brownies...but hey! Try it! You might like it! Wrap leftovers tightly in plastic wrap and store in the refrigerator for up to 3 days. At our house, gravlax rarely lasts that long! Click here for a printable copy of the recipe. Combine the first 7 ingredients in a zip-lock plastic bag. Cut the salmon into strips about 2" x 3". The size of the strips in inches is less important than the size as you "eyeball" it, because uniform pieces will absorb the marinade and then dry more evenly. Add the salmon to the marinade. Seal the bag and refrigerate for 3 hours. Drain the salmon in a colander and pat it dry with paper towels. Turn your dehydrator on to a low setting. Lay the salmon pieces evenly on the machine's racks, put the racks in the dehydrator, and dry the salmon for 1-2 hours. Then turn the salmon pieces over and dry for another 2-3 hours. The drying time will depend on your personal preferences. The salmon will go through a progression like the illustration to the left. We usually sample the fish in the last hour or so of drying, and remove the jerky from the machine when it's dried to our liking - still soft and moist, just a little chewy. Store the jerky in a clean zip-lock bag and keep refrigerated. We eat it just the way it is as snacks, or as a substitute for gravlax, on top of a cream cheese covered toasted bagel, or with scrambled eggs, or in green salad...Mr. Parker claims it'd be wonderful with ice cream, but I draw the line at that. Peace and Calming is a Young Living proprietary blend created by Young Living that may help reduce stress and anxiety, as well as calm tensions and uplift the spirt, promoting relaxation and a deep sense of peace. The ingredients in this blend provide a powerful mix of benefits to calm the nervous and/or agitated horse. It includes tangerine (helps release stress and nervous irritability), orange (calming), ylang ylang (instills confidence and promotes positive emotions), patchouli (dispels negativity) and blue tansy (used to combat anger and negative emotions). This blend has anti-inflammatory properties and helps boost the immune system. Rub Peace and Calming on the horse's chest to promote relaxation and to reduce fear or panic. For pets Peace and Calming may build confidence in new environments. It can also be useful for fear, anxiety, behavior problems, car rides, if animal is wounded, or for over-excitement. Use with Valor for added positive effects. Rub on the bottom of the paws, behind the ears or on the inside of the collar. CAUTION: Contains citrus oils which can cause photo-sensitivity. Peace and Calming can be used to invoke the same sense of relaxation and deep sense of peace that it does in your equine or pet. Peace and Calming can be used aromatically or topically. You can diffuse, inhale directly, dilute with V-6 Vegetable Oil Complex, or apply topically. Add to Young Living Bath & Shower Gel Base for a cleanser your entire family will love.​​. 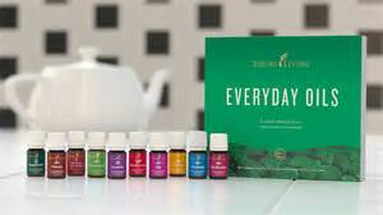 Visit the Wild Heart Mustangs SHOP to purchase and read detailed descriptions of each Young Living oil and blend.